Adorn yourself with a pearl pendant that has been carefully wrapped around in 9ct white gold and studded with diamonds, perfect for adding something a bit more elevated to your jewellery collection. 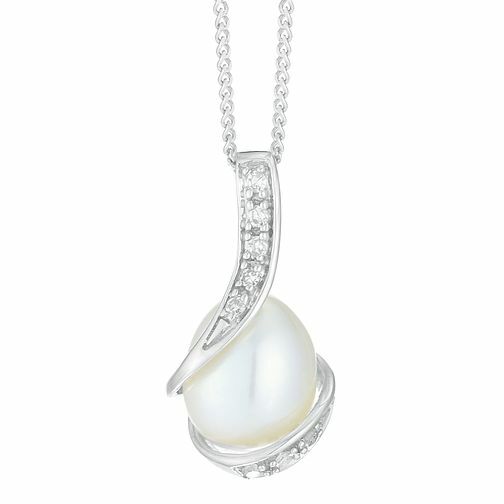 9ct White Gold Diamond Cultured Freshwater Pearl Pendant is rated 5.0 out of 5 by 1. Rated 5 out of 5 by Anonymous from Lovely 30th Anniversary gift. Beautifully fine white gold chain to complement a lovely pearl subtly wrapped in a white gold curl. Very sophisticated look about it even though at a reasonable price. My wife is delighted with it to the point where her beloved diamond necklace is now back in her jewelery box. The only down side was that the chain had become knotted during delivery and took some fine-point tweezers and about an hour to rectify. That aside though, a very good product.